Thursday February 1st 1883 I worked about the house all the forenoon. Bridget washed a few things May and I went over to town right away after dinner I was about town a little while and we waited at the office to see a masquerade procession that did not parade on account of the extreme cold. I staid at Hatts till bed time She has her hands full for Fred Flickenger is sick with rheumatism and Mrs Carney has a young babe. Mrs Ogelvie takes care of her. 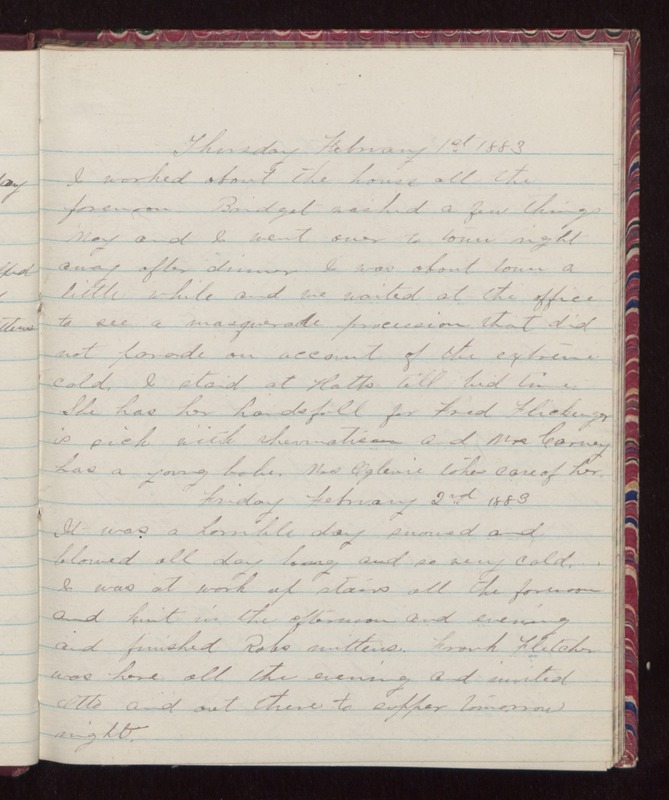 Friday February 2nd 1883 It was a horrible day snowed and blowed all day long and so very cold. I was at work up stairs all the forenoon and knit in the afternoon and evening and finished Robs mittens. Frank Fletcher was here all the evening and invited Otto and out there to supper tomorrow night.